Situated between Farringdon, King's Cross and Islington is Clerkenwell; yet another of London's Victorian areas that has enjoyed a renaissance in recent years. 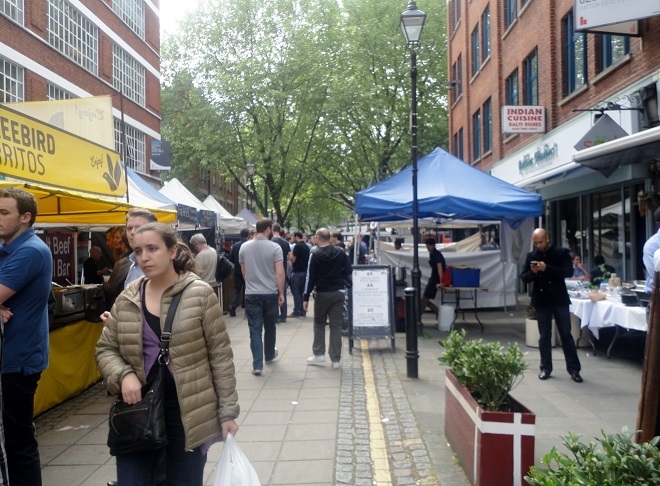 If you take a short walk along Farringdon Road from Farringdon Station you will find yourself in Exmouth Market, a street that comes to life at lunchtimes with its range of market stalls selling street foods, as well as its fixed restaurants and cafes that spread out onto the pavements when the weather is fine. This pedestrianised street is not only for foodies; you can also shop for books, home wares, jewellery and beauty products. However it is the range of restaurants and the selection of food stalls that are bound to catch your eye and tempt your nostrils, especially when the sun shines. When I visited last week I wasn't even very hungry, but it was hard not to be tempted. It was a difficult choice. 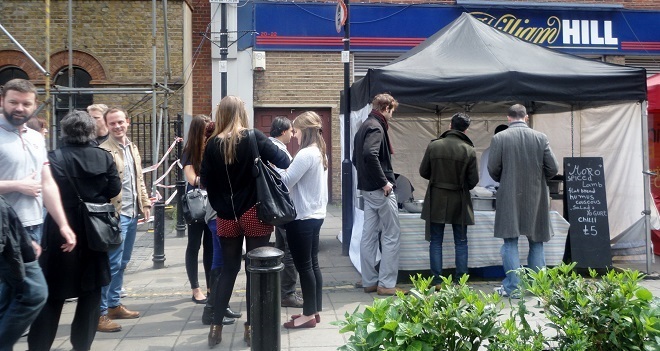 Should I try the dish of the day from the Moro stall (they also have a restaurant in Exmouth market) and the queue was the longest in the street, or how about a curry or a Freebird burrito? 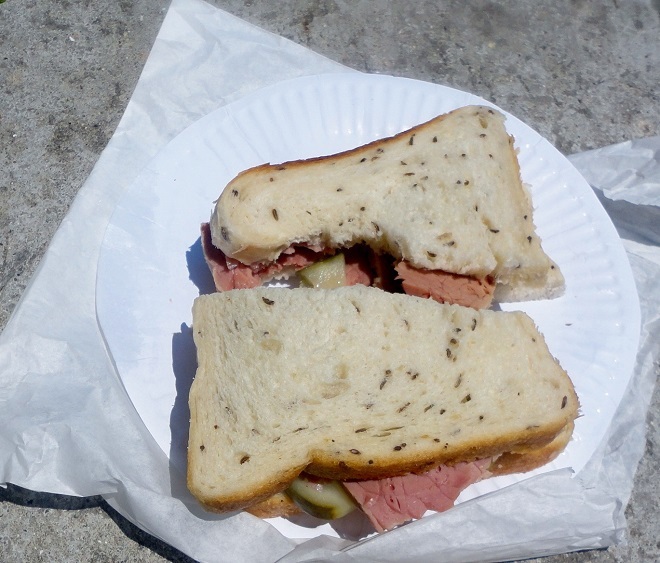 I decided on a salt beef sandwich from the Jewish Deli. I was assured that the salt beef is made by the stall owner and I can confirm that it was delicious. Very lean, without a hint of fat, served on rye bread with pickled cucumber and the option of mustard, and washed down with an iced tea bought in a local shop. You will have to sit wherever you can find a seat, but on a beautiful day as I had, all you need is to pop through Spa Fields Lane into neighbouring Spa Fields and eat al fresco. The food stalls are in situ from around midday until 3pm, with different ones setting up their pitches on various days of the week. Other ethnic specialities include meat and vegetarian Bangladeshi tandoori dishes from Gulshan, vegetarian thalis and samosas at Gujarati Rasoi, sweet treats from Ion Patisserie, Ghanaian delicacies courtesy of Spinach and Agushi and gluten free, buckwheat crêpes cooked by Crêpes & Galettes. I think I'll have to go back on another day of the week to try out some different specialities. I might even see you there too.